Before I get into the benefits of an online TEFL course I am going to share with you an argument some have against online courses. I will also do a little bit of a comparison between the two. If you are wondering if you should take a TEFL course online vs. in the classroom then read on. But if you have already decided that an online TEFL course is for you then skip ahead to the benefits. I sometimes see comments in forums or other places on the web made that say that online TEFL/TESOL courses aren't worth it, aren't any good or some employers won't accept them (more on that at the end). The main point made by classroom TEFL/TESOL supporters is that there is no observed teaching practice. Usually in-class courses have 6 hours of observed teaching practice. Observed teaching practice is good. In that time teachers will assess your performance and remind you of all the information that you learned in the course or that can be learned in books or in some online TEFL courses. 6 hours is the equivalent of a teaching day in a hagwon in Korea. Six hours is a relatively short period of time and this is not going to make or break you as a teacher. To become a good teacher or a good anything you're going to need a lot of review, repetition and experience. Some of the dogmatic opinions found on the web are made by "CELTA snobs" and well, they are just opinions. I'd like to offer a different point of view not often heard of in the TEFL/TESOL community. I can't speak for all online TEFL courses or online courses in general as they are not all the same. It depends on the course. Some online TEFL courses aren't any good. "Based on the results of this study, the evidence suggests that there are similar learning outcomes whether students are in a traditional or online class. For many instructors, the move to online classes is of grave concern. Here are some ways that online TEFL/TESOL courses are better than in-class TEFL/TESOL courses. First we'll start with the not so obvious pros of taking an online course. I can't say that these apply to all online courses, but they do apply to the one I have in mind. The number one reason online courses are better is that they can be taken again and again. I can't speak for all online TEFL courses, but this online TEFL course allows the user to retake the course. The single most important thing for learning anything is repetition. To learn how to shoot a basketball you'll need to have someone show you and you'll have to do it again and again. To learn a language or how to play golf you have to practice it again and again. To become a good teacher you have to learn the tools of the trade. But it takes practice and time. And being exposed to the information just one time whether it's online or in-class isn't going to be enough. If you take a classroom course it's a one time experience. Advice on how to take an online TEFL course. Problems will come up too, especially in the beginning. Teaching is not very easy. Simply said you will have a classroom of students to manage and a lesson to teach. There are a lot variables involved and when problems come up you'll have the online course there to access. If you take an in-class course it won't be there when you are finished with it. All online courses do not offer extended access. Access may be just one time through or last for several months. This course allows for extended access and there are a ton of useful resources that aren't only privy to paying customers. That might be access for 75 days, 2-3 or 6 months or so. ESLinsider's advanced course offers unlimited access. Not that you don't have to make an effort in an in-class course, but it's a lot easier to space out in one for at least some of the time. I can't speak for all online TEFL or TESOL courses, but the online TEFL course I am familiar with requires the user to actively participate in the course. I remember my in-class course and there was a lot of lecturing. And most of that went in one ear and out the other. If you take a 120 hour course and only 6 hours of that course are spent actually teaching that leaves a lot of other time for doing other things. Which would include listening to at least some lecturing. Lecturing is boring most of the time for most people. Like I said there was a large part of the course that I took that was spent sitting around listening. It's very easy to space out and not pay attention. In this online course you can't just sit there and do nothing. You have to interact with the material which typically involves answering questions and doing assignments based on the material (video, text, audio) you are being presented with. Looking for a TEFL course near you? You can take an online course from anywhere in the world at anytime. To take an in-class course you'll have to find one near you that begins at a certain time. Online courses are more convenient. Online courses are more affordable. You can easily pay $2000+ for a high end CELTA or Trinity TESOL course. You can take an online course as fast or as slow as you want. Online courses are often faster. Yet, remember if you're focused on getting your certificate as fast as possible you might not absorb as much. See the first not so obvious benefit again. You probably won't spend money on gas or resources to get to the TEFL course. Also when you take a classroom based course you tend to get books. But I never really used them and they just got thrown out. I even took some to Taiwan, but let me tell you big books aren't very compatible with travel. So with an online course trees aren't chopped down for paper or books that just end up in the trash. I got several big books from the in-class course that I took and like her they weren't useful and they just ended up getting thrown out. I also spent money on gas getting to a city nearby that had a course. But I heard that some employers don't accept online TEFL courses? That's true. But let's put it in perspective. First off in Eastern Asia the amount of schools that will reject you based on whether you have taken an online course are few and far between. But what about those schools that do? Well, the schools that do care are usually top schools who get a lot of competition for jobs. Competition that has years of experience and maybe even higher qualifications like master's degrees or teaching licenses. So if you don't have experience or qualifications like that a classroom or online course probably won't matter. "Thai's, for the most part, do the hiring (as you know) so; IMO, an on-line TEFL is still a TEFL; and since it's a paper chase it would be as good as anything, except possibly for top flight schools. That's what I think after 5 years in the trenches. Cheers." - THX 1133 on Are online TEFL courses worth it? 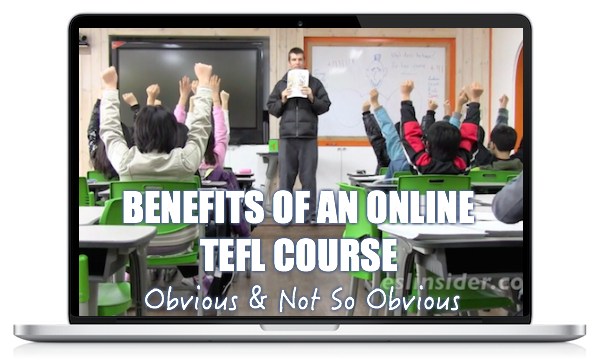 There may certainly be reasons why you want to take an classroom course, but there are a lot of benefits to online TEFL courses or at least to some online TEFL courses.